A memorial to honor student activism during the Vietnam War was unveiled at UC San Diego’s Revelle College. The idea for the memorial was spurred by a group of students in Thurgood Marshall College’s Dimensions of Culture (DOC) program after they learned about the history of UC San Diego student activism during the Vietnam War. The May 1970 Peace Memorial is located adjacent to the Revelle Plaza Fountain. Photo by Erika Johnson / UC San Diego Communications. Niall Twohig, a Ph.D. student in the department of literature and a DOC teaching assistant, said students in his course were surprised to learn about the level of activism on the UC San Diego campus during the late 1960s and early ‘70s and wanted to find a way to commemorate this era. Student activism at UC San Diego directed against U.S. military intervention abroad began as early as the invasion of the Dominican Republic in 1965. It intensified as the country became more heavily involved in Vietnam. Sentiments against the war exploded after the invasion of Cambodia at the end of April 1970. As a way of showing their opposition to what they considered an unjust and widening war, students at UC San Diego joined nationwide student protests. Their actions expressed their desire for an end to the violence. It was during this time that George Winne, Jr., a graduating senior in history, chose to self-immolate in Revelle Plaza on May 10. Winne’s act came just days after the infamous Kent State killings, during the largest wave of protests in the history of American higher education. For decades, faculty and students have held vigils in Revelle Plaza to help remember the students who protested for peace in May of 1970, including Winne. The May 1970 Peace Memorial is designed to promote peace and is part of the revitalization of Revelle College’s Plaza. 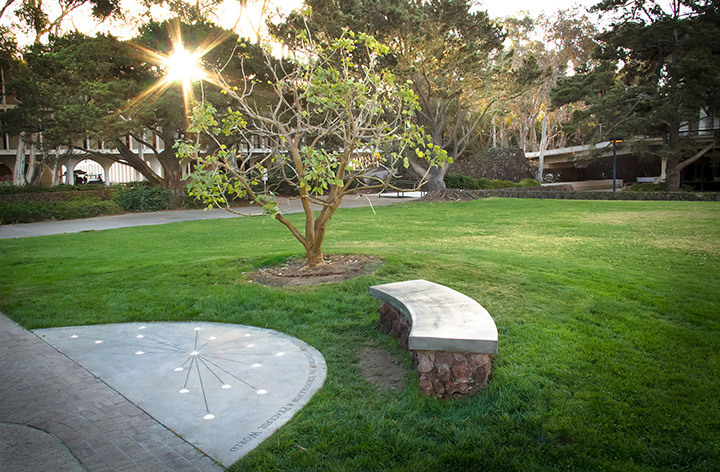 The May 1970 Peace Memorial is located adjacent to the Revelle Plaza Fountain and features a marble plaque complete with a light installation. A bench was added to the space, as was a newly planted coral tree, to give students a place to remember and commemorate the protests for peace since May 1970. According to Twohig, the May 1970 Peace Memorial was made possible through the collaborative efforts of students, staff, faculty, former campus activists, Winne’s surviving family, and campus leadership. Students worked closely with staff in Resource Management and Planning on the design of the memorial and selection of its location.